I know I normally don't do fashion book reviews, and if I talk (write) about books, its more of an aside at the end of my post. But, I read this book over the weekend, and thought it was super cute. Okay, one of my guilty pleasures (besides the bodice-rippers and the sci-fi oh... and the books about teen wizards) are those chicklit books. You know the ones, with the spunky, clueless heroine who has some set backs and comes up roses in the end by staying true to herself? (Confessions of a Shopaholic, Devil Wears Prada, The Second Assistant, I'm looking at you...) Well, this is sorta like that. Michael Tonello, who now writes for HuffPo tells his story of how he accidently fell into the luxury resell market and the ups and downs it held for him. 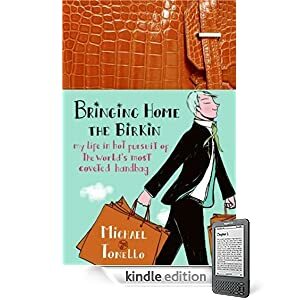 It particularly focuses on his search for the (at the time) elusive Hermes Birkin bag. Its a quirky, fun quick read and is a great option after finishing something heavier in nature. :-) This was in my library's non-fiction section next to the business books, which is how I happened upon it. It was a few books away from the books about Sam Walton LOL. I suspect this one was more fun to read. This is such a great book! I also highly recommend! Really fun summer reading. I am definitely adding it to my wishlist!! Alt Needed - :-) I thought it was so cute. This is a great book....loved it too. Sounds good - I will have to pick it up when I am finished with my stack!